It is considered an honor to live in one of the University’s prestigious rooms on the Lawn, probably the most popular place for all UVA students to relax, study, and play. Located in Mr. Jefferson's original buildings, the Academical Village, these 54 single rooms are truly in the center of the University. Each room is furnished with a lofted bed with ladder above a daybed with cover, a secretary desk with chair, a hutch containing a refrigerator with freezer and a microwave, a built-in closet and sink closet, and a rocking chair. Most rooms have a fireplace. While no air conditioning, kitchen, or study lounges are available, students can find whatever is needed just a few steps from their doors. Lawn room applicants must be undergraduate degree candidates in their final year of study at the University. Students enrolled in the joint College of Arts & Sciences/Curry School Master of Teaching program may apply in either their fourth or fifth year, but not both. Students in the joint College/Batten School Master of Public Policy program may only apply in their fourth year. Students must use their Lawn room as their primary University residence if selected. In addition, it is expected that students selected to live on the Lawn will not study abroad during that academic term (exclusive of J-Term). Starting in mid-November, students who wish to apply to live on the Lawn can find the form in the Housing Application section of this site under Returning Undergraduates. * Firewood Notice: Please do not bring firewood from home! Due to the risk of infestation by the Emerald Ash Borer, all firewood must be purchased locally. 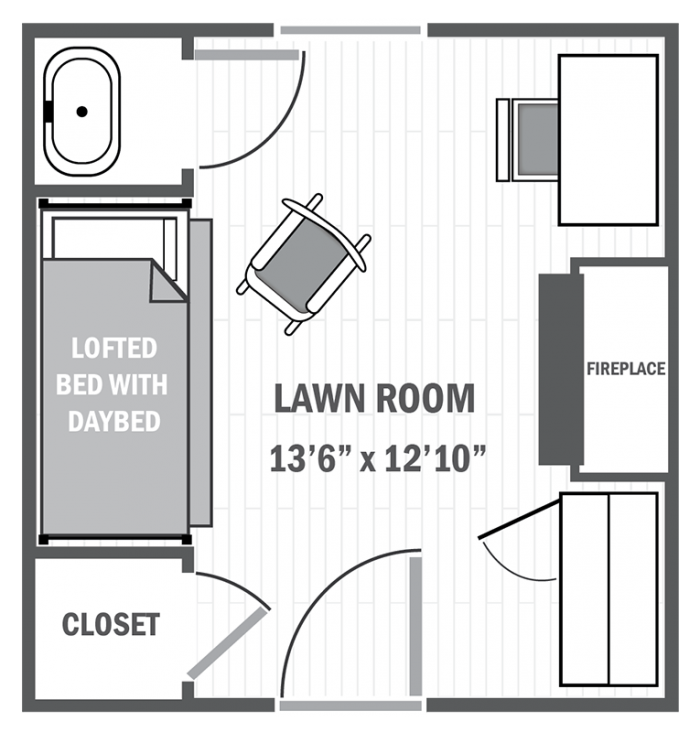 * Due to State Fire Marshal requirements, lofts and other furniture in Lawn rooms must comply with the Lawn and Range Loft Furniture Guidelines as stated in the Addendum to the Terms & Conditions for Lawn and Range Residents. * The Lawn Accessibility Project is currently underway to make the Lawn more accessible to students, faculty, staff, and visitors with mobility issues.